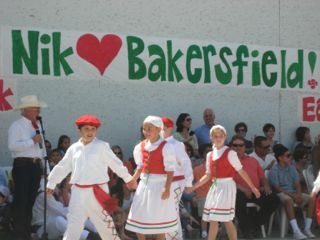 The ex-sheepherders wore blue scarves at the Chino Basque Festival where they met old friends and family. A group of Basque men who spent several years in their youth herding sheep around the Western states have come back to relive those days, bringing wives and children with them. 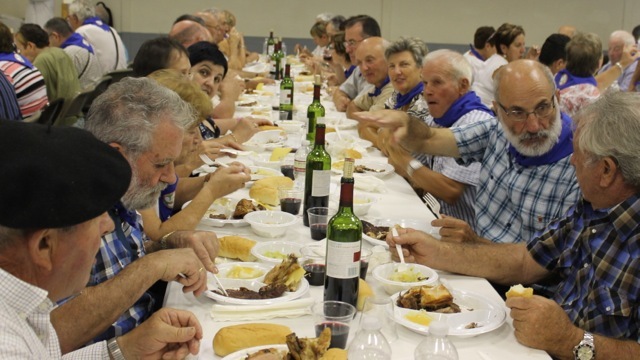 The group, 84 in total, spent this week traveling through California’s Basque communities, in hopes of finding old friends and meeting new ones along the way. The group’s trip started last Saturday, when they flew out of Pamplona’s airport, then to Madrid, and then landed in Los Angeles. “It was the longest day of my life,” said Jose Antonio Abaurrea, noting that he left Europe at 10 a.m., flew for 12 hours without sleeping, then landed in the U.S. at 3:45 p.m.
Three friends from sheepherding days in Bakersfield meet after 48 years. On Sunday, Abaurrea, of Arrieta, and Ignacio Marmun of Erro had already met up with an old friend. They were enjoying some laughs by the bar during the Chino Basque festival with Melchor Gragirena of Bakersfield, remembering old times. 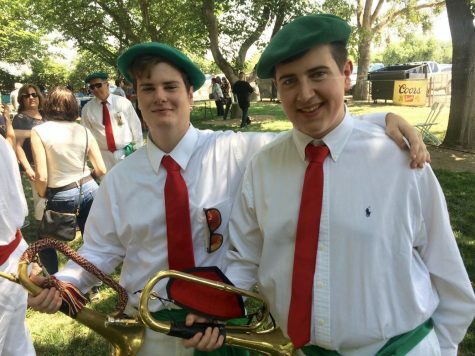 “We worked together for the same boss,” said Abaurrea, referring to Leonard Bidart. He and Gragirena traveled to the U.S. together on the same flight. Today, Gragirena runs his own business, El Tejon Sheep Co. They hadn’t seen each other in 48 years. “I heard they were coming so I came down,” said Gragirena. 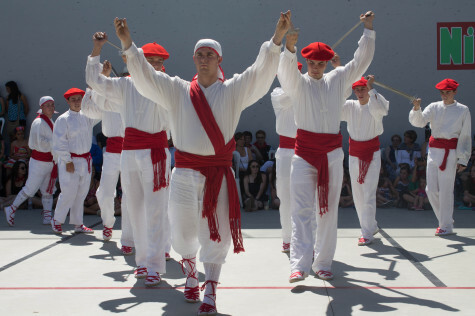 The former sheepherders are part of an association in the Basque Country known as Euskal Artzainak Ameriketan (The Basque Sheepherders of America). 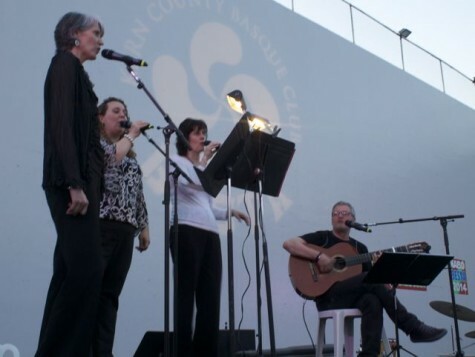 Angie Ochandorena, originally from Chino, was accompanying the group from the Basque Country along with Laura Yanci. Ochandorena explained that most of the 42 men on the trip herded sheep in the U.S. during the 1950s, returned home and never came back. “We wanted to bring a couple of them back here,” she told the festival audience with a laugh. 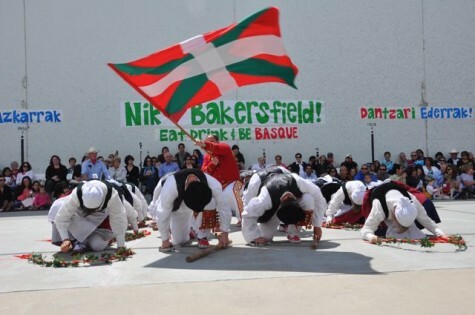 “It turned out to be 81,” she said as she presented the president of the Chino Basque Club with a token gift during Sunday’s festival. Later, she explained to Euskal Kazeta that the group grew as more people found out about the trip, and ultimately, the group maxed out at 81, because she wanted to be able to transport everyone on one bus and that was the largest bus they could find. Coincidentally, the bus broke down in the morning, said Ochandorena Sunday, and they weren’t sure how they were getting back to the hotel from the festival later that day. The week’s itinerary started in Chino, continued through Bakersfield and Fresno, and ends in San Francisco Monday. The trip does not include any typical touristy spots, noted Ochandorena. 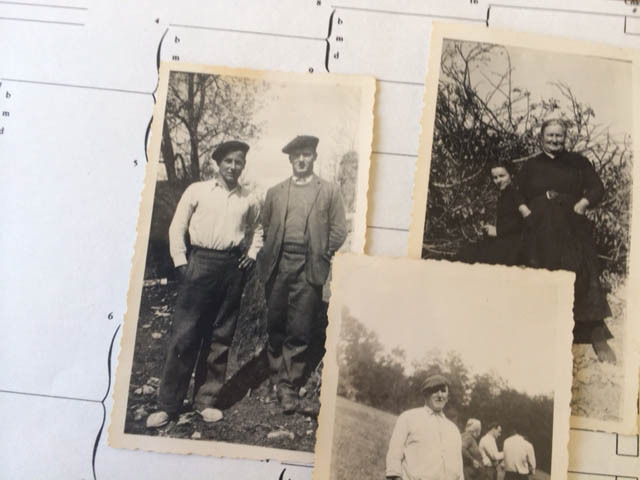 They are traveling to the Basque centers in each community, in hopes of finding old friends and family members. Elena Echegaray, in the blue scarf, reunites with all of her siblings for the first time since they left their Basque Country home when she was a child. Television host Julian Iantzi, in green t-shirt, was filming the reunion for a documentary of the trip. This was a special trip for Elena Echegaray. 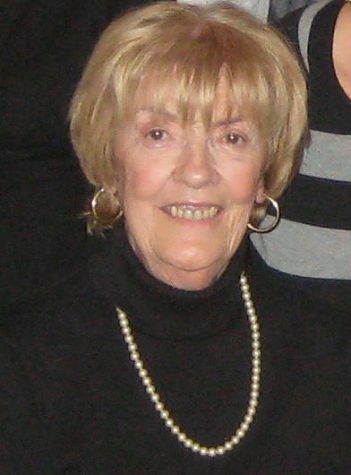 She was only five years old when her older brothers and sisters traveled to America in 1966 and 1967. “I was the youngest,” she noted. Echegaray choked up as she explained that Sunday was the first time since they all left that all five siblings have been together. They have been back to visit her in Lesaka over the years, “but somebody was always missing,” she noted. Her brothers and sisters, who are spread across California, all came to Chino to see their sister and enjoy some time together. 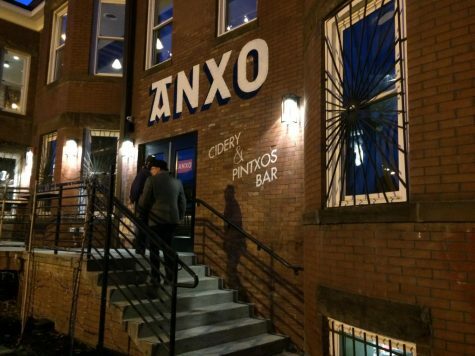 “We want to do histories of their lives, now and in the past,” said Iantzi. Some of the former sheepherders were bringing family members to the U.S. for the first time. Jose Luis Arrechea and his wife Gloria Maya are both from Etchalar, where they still live today. Arrechea left the U.S. 40 years ago. “I have great satisfaction in being able to bring my wife to visit the U.S.,” said Arrechea. Juan Cruz Baldu Arruti is another one who made the trip. He herded sheep here for five years. He related to Euskal Kazeta that at the time, he wanted to stay in the U.S., but his mother and father asked him to come back. “All my brothers and sisters had left the farm,” he said at the Chino festival Sunday. His parents wanted to pass down their sheep business. Today, he still runs the family sheep business, but he’s expanded into agritourism, renting out 10 rooms in a rural house just outside of San Sebastian. Karlos Agirre also is part of the group. 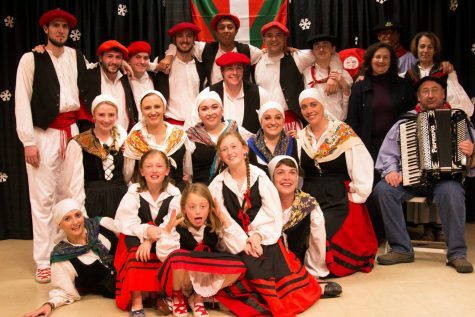 He has a travel agency, Viajes Itsaslur, that specializes in hosting trips in the Basque Country to promote the Basque culture and also sponsoring language immersion programs. 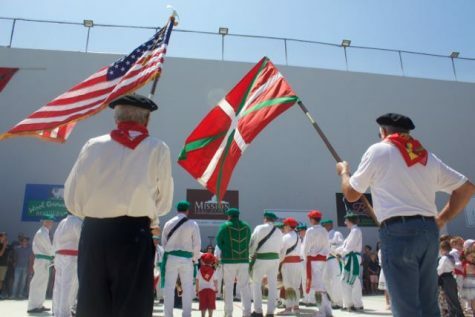 During this trip, he was hoping to make long-term connections with U.S. Basque groups to promote more intercultural exchanges and organize stays for Basque Americans who want to learn Euskera. 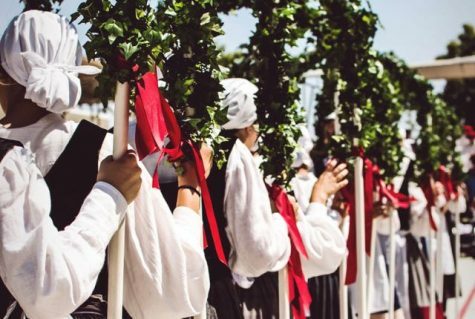 Based in the province of Nafarroa, the ex-sheepherders have been gathering annually for the past few years. 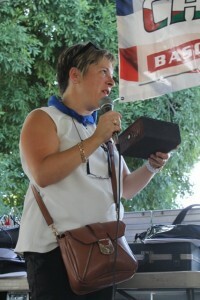 Laura Yanci founded the group. When her father, a former sheepherder in America as well, passed away, she wanted to organize a gathering of sheepherders. About 700 showed up to that first picnic, held in Lesaka. The gatherings continue annually. 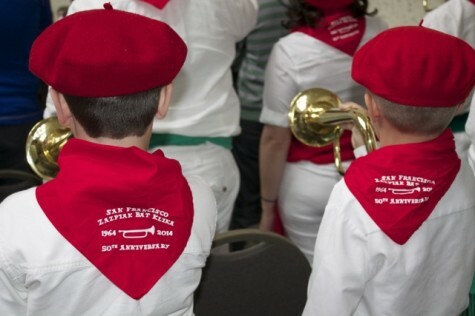 Last year the group met in Iruñea-Pamplona. 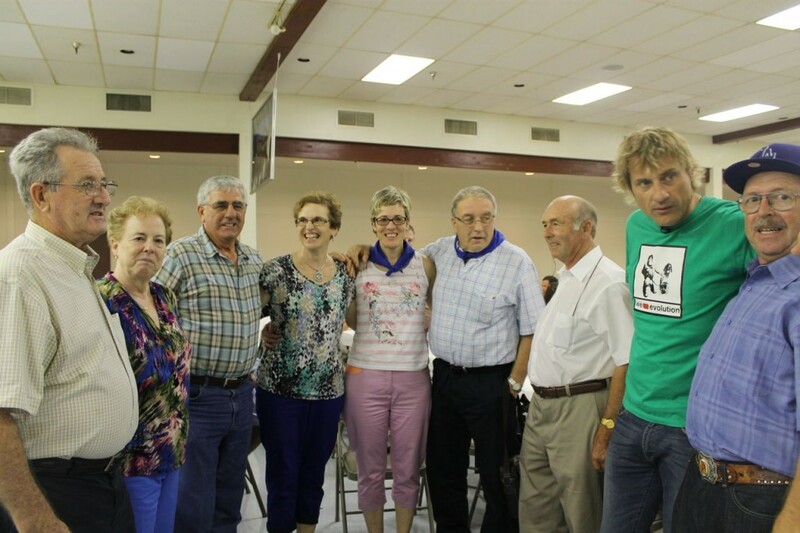 The California visitors will have stories to tell at the next picnic, scheduled for Sept. 21 in St. Jean Pied de Port. through his travel agency, Itsaslur Bidaiak.